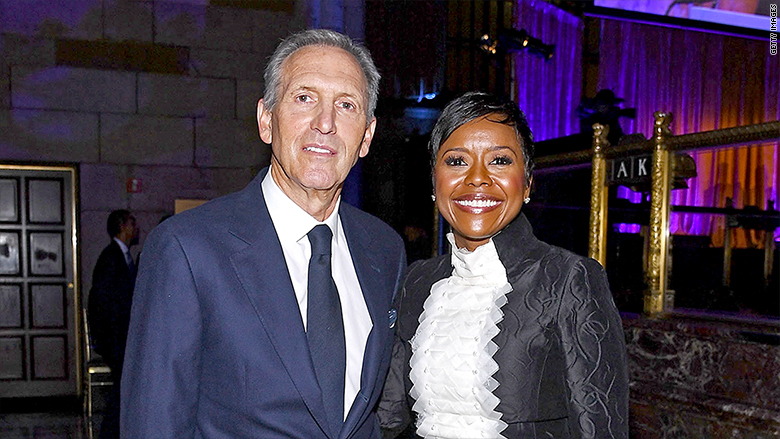 When it comes to race, one of the defining moments in Mellody Hobson's life was when she was mistaken for a member of the wait staff at a 2006 luncheon she was throwing for a friend who was running for Senate. "We get to the receptionist and she says, 'Where are your uniforms?," Hobson recalls. "We didn't yell or say anything... It just led me to joke -- 'That's why we need more than one black person in the Senate' -- which at the time there was only one," Hobson says. When it comes to the boardroom, black professionals -- and more specifically black women -- are also a rarity. Only 2.2% of Fortune 500 board seats are held by black women. Hobson is the president of Ariel Investments, a Chicago-based investment firm with $12.4 billion in assets under management. 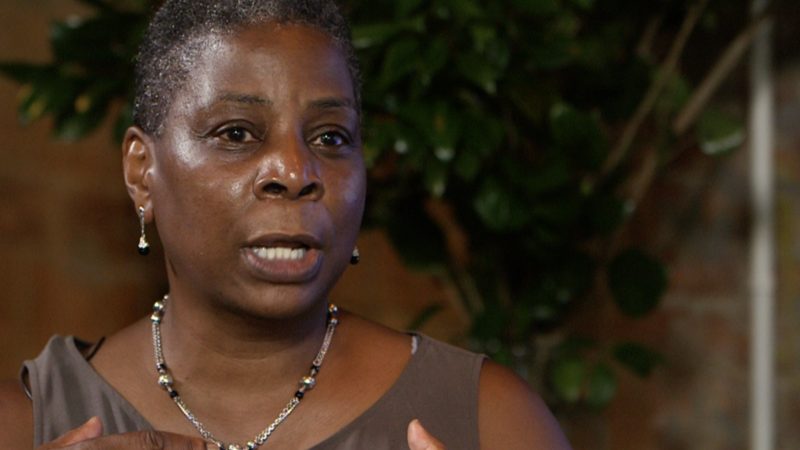 She is also the first African-American woman to chair the Economic Club of Chicago. She sits on the board of Starbucks (SBUX) and Estee Lauder (EL), and served as chair of DreamWorks Animation, prior to the sale of the company. "You shouldn't have to be exceptional to just have a normal life in this country, and that is what has happened to a lot of black and brown people," Hobson says in CNN's latest Boss Files with Poppy Harlow podcast. "It's devastating to be having this conversation, on the one hand," Hobson says. But "I want to be very clear there have also been great strides that have been made in our country." "I'm not in a field picking cotton. I'm sitting here with you and I have an enormous and amazing life," Hobson says. Raised by a single mother in Chicago, and one of six children, Hobson became fiercely independent early in life. She recalls her mother "always struggling to make ends meet and to keep things together," and remembers vividly when they would get evicted from their Chicago apartments or the phone line would get disconnected and the lights turned off. 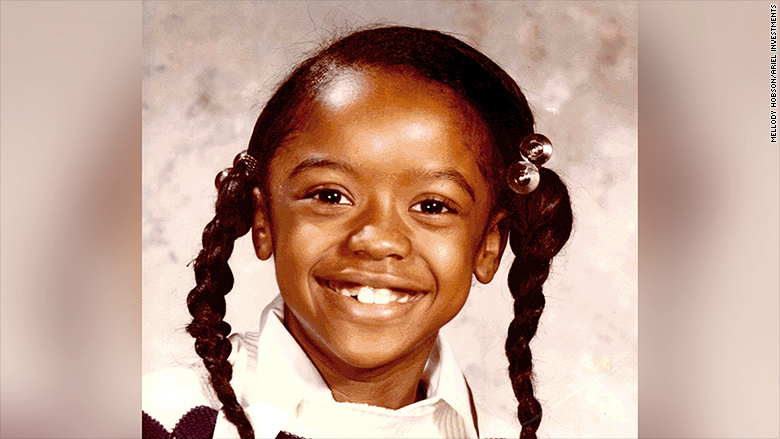 Mellody Hobson was raised by a single mother in Chicago. "I think I was destined to be in the investment business, because I desperately, as a child, wanted to understand money... That was born out of a sense of financial insecurity," she says. Hobson went on to attend Princeton University before joining Ariel Investments in her early 20's. At Ariel, she is keenly focused on maintaining diversity. Currently, 51% of Ariel's employees are women, 27% are African-American and nearly two-thirds of the executive team is both female and a minority. "I would say the reason that we have those kinds of statistics is that we have a lens that says everyone has something to add. That we don't have any barriers to entry around 'What schools did you go to?' 'Where do you come from?' 'What's your life experience?' All of those experiences we believe lead to a better outcome," Hobson says. Starbucks Executive Chairman Howard Schultz counts Hobson among his closest friends and tells CNN, she "possesses the rarest of intellectual dexterity and humility. She has in the past stated publicly that when she joined the Starbucks Board almost fifteen years ago, 'she came to learn.' Truth is, she become our teacher. Her compassion and empathy for the human condition is only equaled by the enormous reservoir of her life experience (which she draws from) and her innate business acumen." Hobson speaks publicly about being "unapologetically black and unapologetically a woman." The way she puts it, "I started thinking about all the ways in which I'd apologized for being me, and I said I'm going to stop doing that." What she does not want is for people to be color-blind. "I think it's a cop out for people. I've had so many people tell me how color-blind they are. They say I don't even see race. I say to them 'But you aren't even noticing everyone around you is white,'" Hobson argues. "Let's start seeing it and talking about it and embracing these differences as opposed to trying to pretend they don't exist." Her solution -- be "color brave" instead. Starbucks CEO Howard Schultz says Hobson "became our teacher." Facebook COO Sheryl Sandberg credits Hobson with having a profound impact on her life, and tells CNN, "Mellody often talks about being 'color brave' — speaking openly and honestly about race. It reminds us all how important it is to have conversations that might make us uncomfortable, but are necessary to make real change. She's inspired me to be brave in many aspects of my life." In December, the Pew Research Center released a poll that found that 56% of Americans say race relations are "generally bad" -- while 44% say too little attention is paid to issues of race today. Hobson says she's very concerned about the lack of black female executives in Corporate America. And the numbers tell the story. Only three Fortune 500 CEOs are African American, and they are all men. Hobson argues that corporations need to make hiring and elevating black employees a priority. "In this world, for some reason we've all become okay with this idea that it's a process. I think that we've got to just be more deliberate about the fact that it just has to happen as a mandate," Hobson argues. Hobson credits her mother for her strength and independence. "She always told me I could do anything," Hobson recalls with a smile. She took that advice literally, and notes, "hopefully I haven't peaked yet." She is now passing her mother's guidance down to her young daughter, Everest. "I think the number one thing you can do for a child is make them independent and my mom created a very independent child from a very, very, very early age," she notes. Asked what she wants her daughter to say about her one day, Hobson says, "I'm proud of my mother. I think we all want that."